Devikulam is a hill retreat known for its picturesque landscapes in God’s Own Country, Kerala. Gurgling waterfalls cutting across the sharp sides of rocks and hillocks covered with a lush carpet of velvety meadows usher you to enjoy the scenic surroundings. 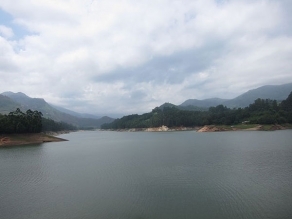 Devikulam is about 7km from Munnar in the Idukki district. Nature lovers are here for a treat as they can admire and study divergent flora and fauna. Trout fishing is another activity carried out here. Devikulam is a trekker’s delight and an excursion through plantations and red gum trees would truly vouch for an enchanting experience. The main attraction of this place is Sita Devi Lake. According to legends, Goddess Sita bathed in the same. Pallivasal Falls is a beautiful spot which is recommended to cover. One should surely not miss a guided plantation tour to know more about the flora and fauna of Devikulam.One can plan a trip covering Devikulam as well as Munnar which is very close by. The weather here, all year around, is pleasant. Summers, Monsoons and winters are the main seasons . Summers and Monsoons are ideal seasons to visit Devikulam as temperatures fall up considerably in winter. The climate in summer is pleasant, and the temperature drops in the night. Tourists crowd this place mainly to connect to nature and rejuvenate themselves in the process. The tranquil climate lulling you into deep contemplation would certainly recharge you as you can go back to your routine, revitalised. Devikulam is easily accessible by road from both Kochi and Kottayam and the road trip is a pleasing experience to nature lovers. Road options include both State Transport Buses and private buses. The route to Devikulam is full of breathtaking sceneries and steep slopes. Tickets are cheap; buses can be crowded though. Devikulam is not directly connected though rail, but travellers can take trains to the nearest railway stations. Kochi (150 km) and Kottayam (136 km) are the nearest cities connected through trains. After reaching these major railheads one can take buses or hire a taxi or private cars to reach Devikulam. Kochi International Airport, which is around 111 km from the Devikulam town, is the nearest airport. Kochi Airport is well connected to other Indian cities such as Bangalore, Chennai, Mumbai and Delhi. Travellers can avail prepaid taxis from the airport, and they cost between Rs 7 and Rs 12 per km depending on the vehicle.